"Good bread is the most fundamentally satisfying of all foods; and good bread with fresh butter, the greatest of feasts.” ~ James Beard (1903-1985), Beard on Bread. Making bread for me is one of my favourite things to do. 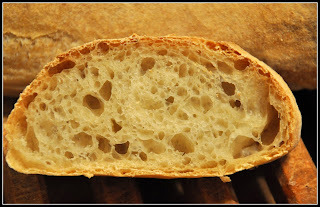 When these simple ingredients stand alone, they may not be that appealing - flour, yeast and water - but when combined they are transformed into something so delicious...and the process so satisfying. 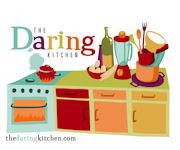 The kneading of the dough, the exquisite aromas and the pleasure of my friends and family enjoying the results is worth the time and effort that goes into it. I would like to thank Brian, who welcomed me to The Bread Challenge, a group of enthusiastic amateur and professional bakers of artisan breads who have joined together to bake their way through Jeffrey Hamelman's landmark book, Bread: A Baker's Book of Techniques and Recipes . The challenge is open to anyone ...just go to the site to learn more and join us! 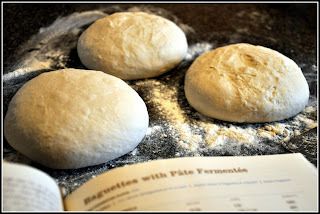 This is my first bread of the Challenge - Baguettes with Poolish on page 101. First I made the Poolish - it had to stand for 12-16 hours so I made it the night before I planned to bake. 2nd - Mixed the rest of the ingredients for about 6 minutes. The dough should be about 76 degrees F.
5th - After 2 hours...amazing! 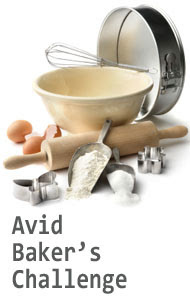 6 - Divide the dough into 12 oz pieces and preshape into rounds. Here they are on my floured surface, then I covered them with plastic - about 30 minutes. 7- I shaped the loaves....I am not very good at shaping baguettes. I think I know what I do wrong though. My oven...actually most home ovens, are just not big enough for a regular baguette, so we have to make them shorter which means we need to use less dough to do that. I used the same amount of dough for a traditional baguette and made it shorter which totally destroys the shape and made it fatter! 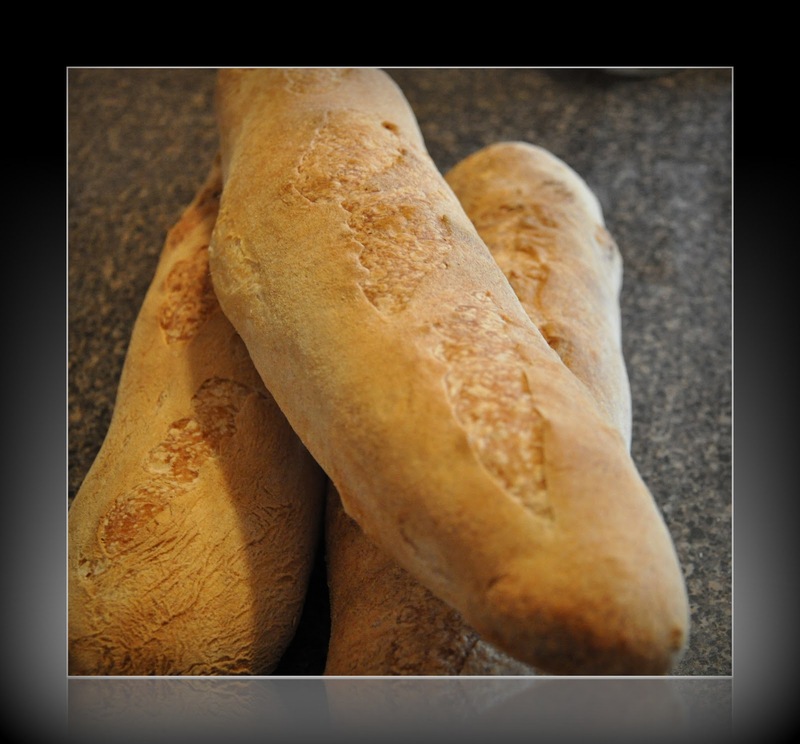 According to wikipedia, a standard baguette has a diameter of about 5 or 6 cm (2 or 2⅓ in) and a usual length of about 65 cm (24 in), although a baguette can be up to a meter (39 in) long. The bottom line, only use as much dough as you need to achieve this and at the same time, fit them into your oven! I know I know ...these are toooooo fat! I placed the loaves between the folds of the baker's linen and let them rest - covered with plastic. 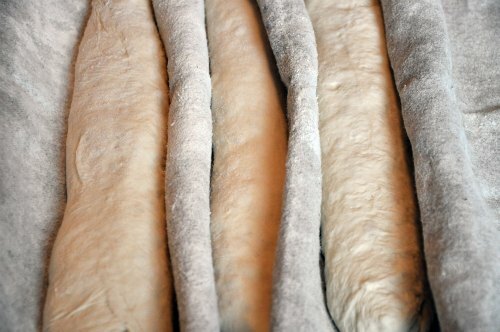 9- It is not so easy to move the baguettes to a peel (a peel transports the dough into the oven). I finally bought myself the flipping board. Here is how it works! I saw it on Susan's blog at Wild Yeast. I love it and I bought it from TMB. 10- And then I scored the loaves....not well...I need to definitely practice this...I had an off day! And here they are - don't laugh!!! They are odd shaped! Definitely roll them about 1 inch in diameter as they expand...now that is narrow! It has been fun...and the bread tasted good! Next up - I am going to make the whole wheat bread with a Multigrain soaker.